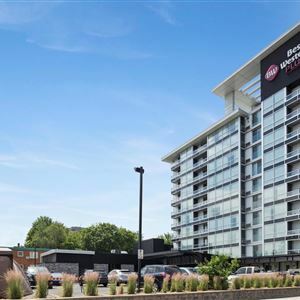 Property Location With a stay at Best Western Plus Gatineau-Ottawa, you'll be centrally located in Gatineau, steps from Jacques Cartier Park and minutes from Canadian Museum of History. This eco-friendly hotel is within close proximity of Ministere du Revenue and Royal Canadian Mint. Rooms Make yourself at home in one of the 133 air-conditioned rooms featuring refrigerators and MP3 docking stations. Your room comes with a pillowtop bed. 42-inch LCD televisions with digital programming provide entertainment, while complimentary wireless Internet access keeps you connected. Private bathrooms with shower/tub combinations feature designer toiletries and hair dryers. Amenities Enjoy recreational amenities such as an indoor pool and a 24-hour fitness center. Additional features at this hotel include complimentary wireless Internet access, concierge services, and wedding services. Dining Enjoy a satisfying meal at a restaurant serving guests of Best Western Plus Gatineau-Ottawa. Quench your thirst with your favorite drink at a bar/lounge. Cooked-to-order breakfasts are available daily from 6 AM to 11 AM for a fee. Business, Other Amenities Featured amenities include a 24-hour business center, express check-out, and complimentary newspapers in the lobby. Planning an event in Gatineau? This hotel has 4155 square feet (386 square meters) of space consisting of a conference center and meeting rooms. Self parking (subject to charges) is available onsite. 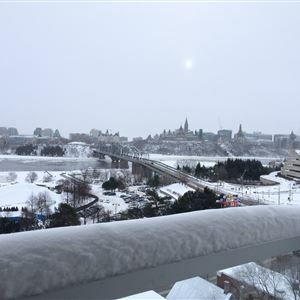 With a stay at Best Western Plus Gatineau-Ottawa, you'll be centrally located in Gatineau, steps from Jacques Cartier Park and minutes from Canadian Museum of History. This eco-friendly hotel is within close proximity of Ministere du Revenue and Royal Canadian Mint. Make yourself at home in one of the 133 air-conditioned rooms featuring refrigerators and MP3 docking stations. Your room comes with a pillowtop bed. 42-inch LCD televisions with digital programming provide entertainment, while complimentary wireless Internet access keeps you connected. Private bathrooms with shower/tub combinations feature designer toiletries and hair dryers. Enjoy a satisfying meal at a restaurant serving guests of Best Western Plus Gatineau-Ottawa. Quench your thirst with your favorite drink at a bar/lounge. Cooked-to-order breakfasts are available daily from 6 AM to 11 AM for a fee. Featured amenities include a 24-hour business center, express check-out, and complimentary newspapers in the lobby. Planning an event in Gatineau? This hotel has 4155 square feet (386 square meters) of space consisting of a conference center and meeting rooms. Self parking (subject to charges) is available onsite.